- Prevent the creation of Goo strands between walls. - Indicate how to begin to play (put the fuse Goo in the fire), with text or sign. - Draw branches to bring balloons. - Continue to draw the decor. - Add animated graphic elements, to make something more dynamic. - Add traps (maybe gears) at the top and the left. 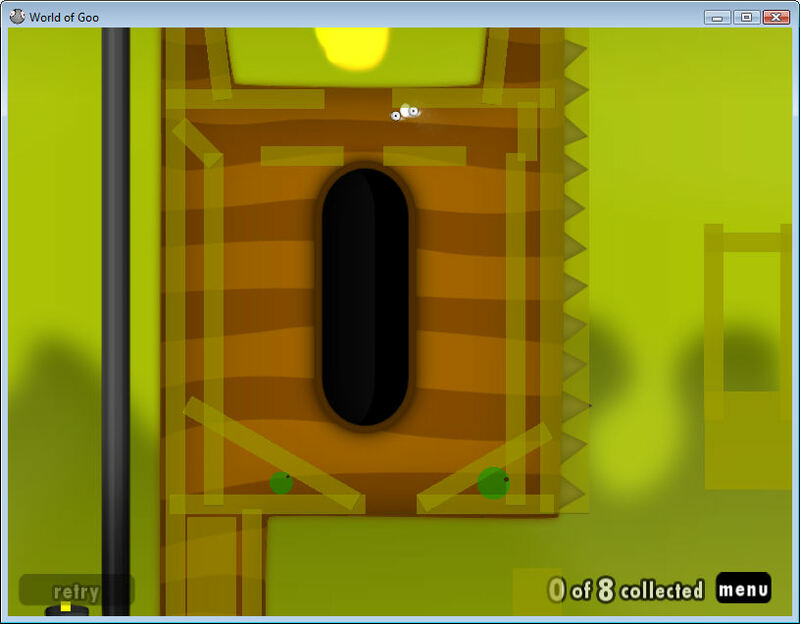 - Test the level with several screen resolutions. - Maybe add sound background. - Check all objects' positions, especially deadly zones. - Verify the feasibility of the goals (normal & OCD). - Download in GooMod (advised). Installable with GooTool. Update: A new version (0.1.1) is available ! I was fiddling about putting a rectangle down the whole centre support of the level with various tags but I couldn't seem to get it to break strands. "tag=deadly" seems to kill balls, and kill old strands that touch it, but doesn't seem to kill new strands. Weird! Nice concept, I particularly like how the goo balls are dispensed properly :). I found it pretty confusing to know how to begin the level though (particularly if I hadn't seen the level editor screenshot first); perhaps some better graphical indication of the fact that the the dispenser is flammable. great level. Played it with fun. But you can build through the walls. If you play it the way its meant to be, its really cool. What about making the walls thicker? Yes, it's the only thing to fix this bug ATM. My 1st completion (w/o building through the walls) I gathered 16 goos so perhaps raise the ocd a bit? I think I might have an idea on how to make the goos not go through solids: set strandgeom to true. It worked for my level. Very nice catch GooGun, turns out that's what's used on ImpaleSticky after all.